If you are following a Paleo diet, doing a Whole30 or eating low-carb/keto, you might be getting tired of eating all of your meals with a knife and fork. Don’t you just crave something that you can pick up with both hands and bite into? Well, this bunless burger recipe is coming to your rescue! 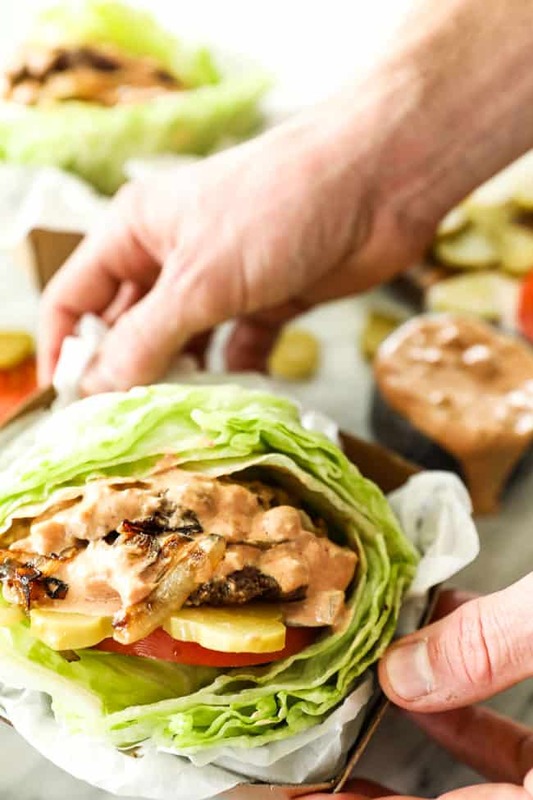 It’s piled high with toppings and an amazing sauce all wrapped up in a crunchy iceberg lettuce bun. I have to say, when I first went Paleo the one craving I had was for a big, juicy burger. I thought I’d crave cheese and sandwiches, but it was really that burger that was calling my name. 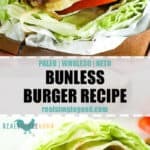 I don’t know why it took me so long to create this bunless burger recipe, it’s exactly what I needed to curb my burger craving! 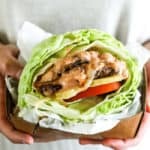 This lettuce burger is actually my preferred burger now. 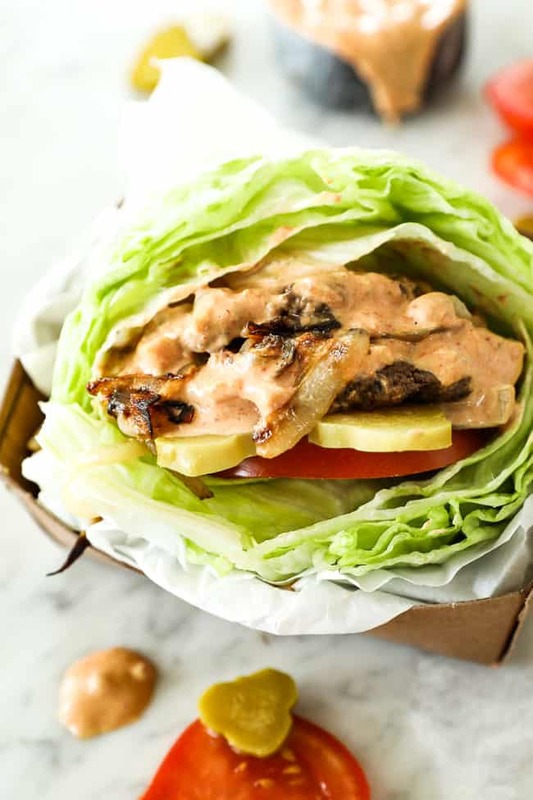 The special sauce is really what takes this bunless burger recipe to the next level. 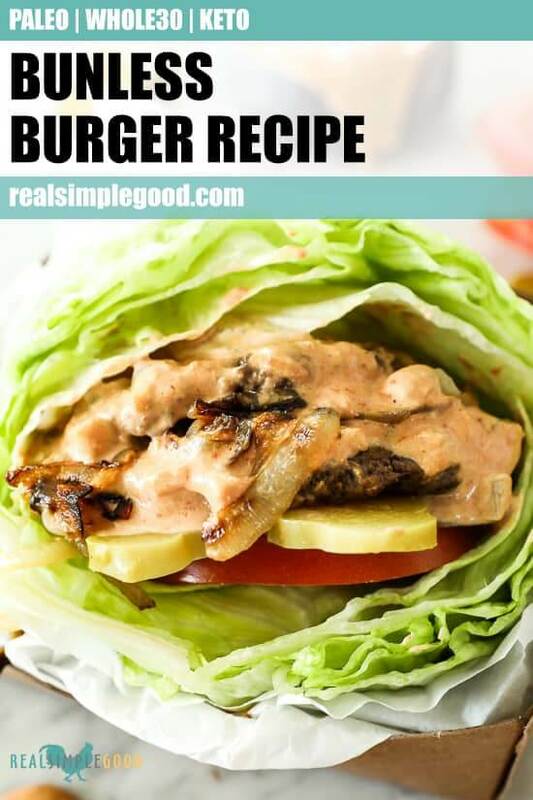 It’s pretty quick and easy to put together, especially if you have a Paleo + Whole30 compliant mayo on hand like Primal Kitchen or Chosen Foods. Do yourself a favor and don’t be stingy with the sauce when you put it on. Slather it all over the burger patty for a truly finger lickin’ burger experience. This is totally optional, but as you can see in the pictures we opted to double up the patties to make this a truly epic bunless burger. Since we made the patties so thin (see the recipe), doubling them up seemed like a good idea. Plus, it gave me an excuse to add some more special sauce, so why not? If you are doubling up the patties, just follow the recipe instructions to assemble the burgers and add the second patty on top of the onions, followed by some more sauce on top of the second burger patty. Trust me, you won’t regret it. Craving a meal you can pick up and eat with two hands or just looking to switch things up from the same old boring recipe routine? Give these bunless burgers with special sauce a try! Leave a comment below and let us know how it goes! Also, take a pic to share on Instagram. Tag us @realsimplegood so we can check it out and maybe even share in our stories. Give us a follow if you don’t already! We’d love to stay connected! LIKE THIS RECIPE? SHARE IT NOW OR PIN IT FOR LATER! 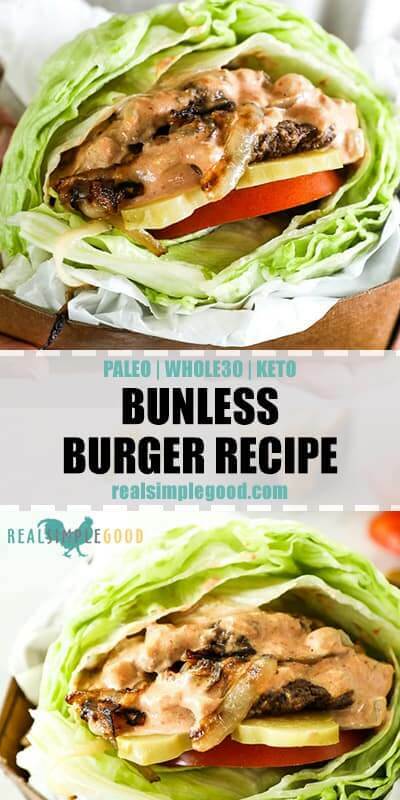 This bunless burger recipe is Paleo, Whole30 + Keto with an amazing special sauce! 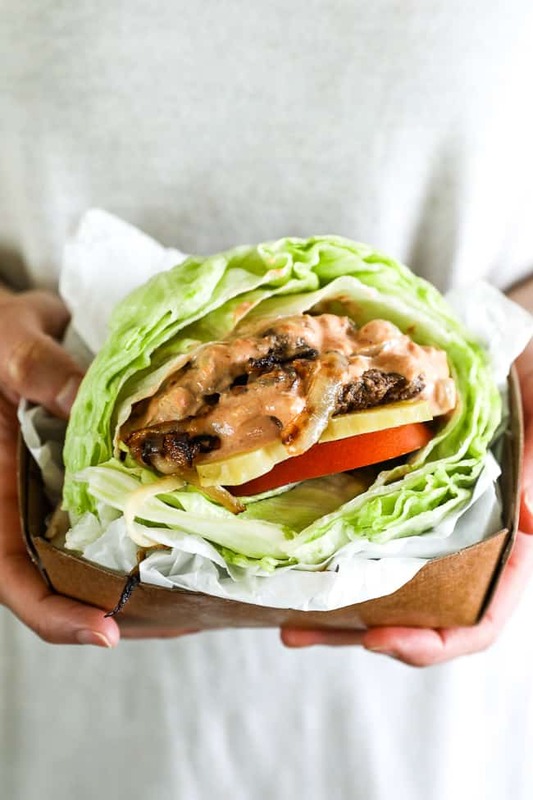 Satisfy your low-carb burger craving today with this lettuce burger. Start by making the sauce. Combine all of the sauce ingredients in a bowl and mix well with a whisk. Refrigerate while you make the burgers. Form beef into burger patties. You want very thin patties, about 1/4 inch thick. 1 lb of beef will make about 4 of these patties. They will be very large and thin (but will shrink a lot when cooking). Season the patties with salt and pepper on both sides and set aside. Slice onion as noted and heat a medium skillet over medium-low heat and add 1 tbsp of ghee. Add the onion to cook, stirring occasionally, until browned and caramelized. This should take about 15 minutes and be finished about the same time as the burgers. If they cook to fast or finish early, just simmer on low until the burgers are ready. Prep the toppings for the burgers as noted. For the buns, cut the iceberg lettuce head into fourths. Cut off the bottom “stem” of each wedge of lettuce. Remove the thick inner pieces, leaving the outer leaves. You’ll split these leaves to form your top and bottom “bun”. Heat a large skillet over medium-high heat and add 1 tbsp ghee. Once the ghee is hot and shimmering, add the burgers to cook for 3-4 minutes per side, or until cooked to your liking. You may have to cook burgers in batches, two at a time. Now, assemble your burgers. Put 1/2 of the lettuce wedge on a plate and add a tomato slice and some pickles at the bottom. Top with a burger patty and spread some sauce over the top. Add on some onions and top with more sauce if desired. 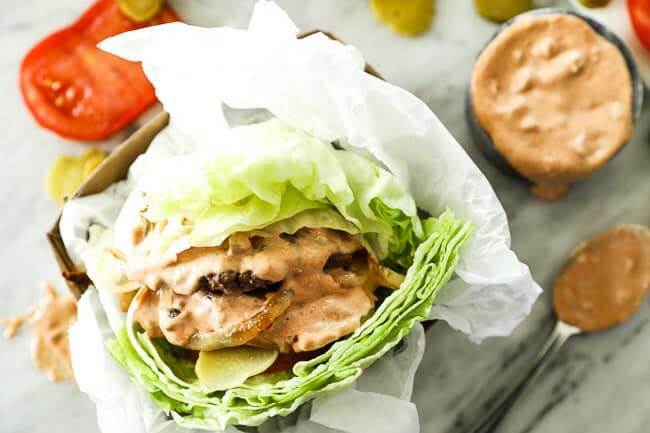 Top with the other 1/2 of the lettuce wedge to form a burger. Pick it up with both hands and enjoy! Nutrition facts are an estimate provided for those following a Ketogenic or low-carb diet. See our full nutrition information disclosure here.